The International Reference Ionosphere (IRI) is an international project sponsored by the Committee on Space Research (COSPAR) and the International Union of Radio Science (URSI). These organizations formed a Working Group (members list) in the late sixties to produce an empirical standard model of the ionosphere, based on all available data sources (charter ). Several steadily improved editions of the model have been released. For given location, time and date, IRI provides monthly averages of the electron density, electron temperature, ion temperature, and ion composition in the altitude range from 50 km to 2000 km. Additionally parameters given by IRI include the Total Electron Content (TEC; a user can select the starting and ending height of the integral), the occurrence probability for Spread-F and also the F1-region, and the equatorial vertical ion drift. 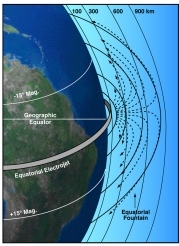 The major data sources are the worldwide network of ionosondes, the powerful incoherent scatter radars (Jicamarca, Arecibo, Millstone Hill, Malvern, St. Santin), the ISIS and Alouette topside sounders, and in situ instruments on several satellites and rockets. IRI is updated yearly during special IRI Workshops (e.g., during COSPAR general assembly). More information can be found in the workshop reports. Several extensions are planned, including models for the ion drift, description of the auroral and polar ionosphere, and consideration of magnetic storm effects. An IRI listserver keeps the community informed about model updates, workshops, publication, and other IRI-related matters. To subscribe send a message (the content doesn't matter) to internationalreferenceionosphere-subscribe@lists.nasa.gov and reply to the confirmation message. The IRI master copy is held at the NASA's Space Physics Data Facility (SPDF) and Community Coordinate Modeling Center (CCMC) and is updated according to the decisions of the IRI Working Group. The software package distributed by SPDF and CCMC includes the FORTRAN subroutines, model coefficients (CCIR and URSI), and documentation files. The IRI build-up and formulas described in detail in a 158-page NSSDC report (Bilitza, 1990). K. Rawer, D. Bilitza, and S. Ramakrishnan, Goals and Status of the International Reference Ionosphere, Rev. Geophys., 16, 177-181, 1978. K. Rawer, S. Ramakrishnan, and D. Bilitza, International Reference Ionosphere 1978, International Union of Radio Science, URSI Special Report, 75 pp., Bruxelles, Belgium, 1978. K. Rawer, J. V. Lincoln, and R. O. Conkright, International Reference Ionosphere-IRI 79, World Data Center A for Solar-Terrestrial Physics, Report UAG-82, 245 pp., Boulder, Colorado, 1981. K. Rawer and C. M. Minnis, Experience with and Proposed Improvements of the International Reference Ionosphere (IRI), World Data Center A for Solar-Terrestrial Physics, Report UAG-90, 235 pp., Boulder, Colorado, 1984. D. Bilitza and K. Rawer, International Reference Ionosphere, pp735-772, in: The Upper Atmosphere - Data Analysis and Interpretation, W. Dieminger, G. Hartmann and R. Leitinger (eds. ), Springer-Verlag Berlin Heidelberg, 1996. D. Bilitza, International Reference Ionosphere - Status 1995/96, Adv. Space Res. 20, #9, 1751-1754, 1997.